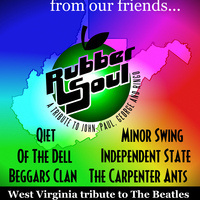 "With A Little Help From Our Friends, A West Virginia Tribute To The Beatles"
This event will pay tribute to the music of the Beatles. Seven bands will be featured playing music from some of their iconic albums. QIET will cover music from "Sgt Peppers Lonely Hearts Club Band"
BEGGARS CLAN will be performing cuts from "The White Album"